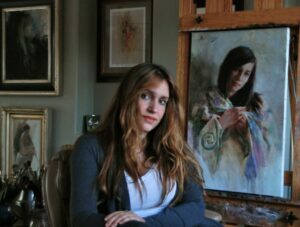 Michelle moved to New Mexico in her teenage years and studied at Art Masters Acadamy with artist Lou Maestas where she first learned to work with oils and paint from a live model. Michelle then went on to attend the prestigious Art Center College of Design in Pasadena California where she attained a solid foundation in drawing and anatomy, studying with teachers such as Steve Huston. Afterward, she returned to New Mexico and began to teach as well as receive numerous portrait commissions. She has lived and worked in California, teaching at the renowned California Art Institute in Westlake Village and at the Los Angeles Academy of Figurative Art. Dunaway was a top finalist in the Portrait Society of America’s International Portrait Competition in 2010, where she won the Award of Exceptional Merit for her double portrait of the daughters of actress Jane Seymour. Michelle was featured in Southwest Art magazine’s “21 under 31” issue as one of the twenty-one emerging fine artists of the United States. Her paintings and drawings have been featured in Art ot the West magazine, American Art Collector magazine, Southwest Art, International Artist and American Artist Workshop. Michelle’s drawings are included in the book Strokes of Genius 2: The Best of Drawing Light and Shadow. Dunaway is represented by The Legacy Gallery in Scottsdale, AZ and Jackson, WY, Sage Creek Gallery in Santa Fe, NM, M Gallery of Fine Art in Charleston, SC and InSight Gallery in Fredericksburg, TX. Her work is in numerous private collections.